Valentine's is for Chocoholics Giveaway! Who doesn't love chocolate? Enjoy a selection of delicious chocolate inspired drinks! 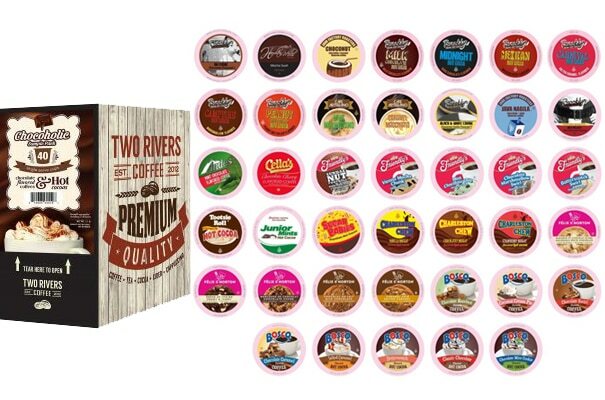 The Two Rivers Chocoholic pack features multiple chocolate coffee flavors paired with caramel, coconut, mint and more. Indulge in the chocolatey hot cocoas that come in mint, butterscotch, salted caramel, toasted marshmallow, and milk chocolate flavors. One (1) lucky winner will receive a Two Rivers Chocoholic Sampler Pack! Contest is open to US only, 18+ (ends January 30th, 2017 at 11:59pm EST). All entries unless otherwise noted are optional. Please enter the giveaway form below. The winner will be emailed and have 48 hours to respond or a new winner will be chosen. Good luck!